In Chinese military culture there has long been a distinction between two heavy maces, the 鞭 ( biān ) and the 鐧 ( jiǎn ). The former always has a bamboo-sectioned blade, sometimes of round and sometimes of angular cross-section. The latter tends to have a smooth blade of angular (often square or rectangular) cross-section, sometimes with grooves. Beware, it's easy to confuse Chinese weapons. The character for the former, 鞭 ( biān ), means "whip" and can also mean a leather or iron flexible whip. The character 鐧 is pronounced jiǎn which, to the uninitiated, may sound very similar to 劍 ( jiàn ) for straightsword. Large, two handed versions of both bian and jian were in military use in the Ming dynasty. By the Qing, we only find references to single handed versions. 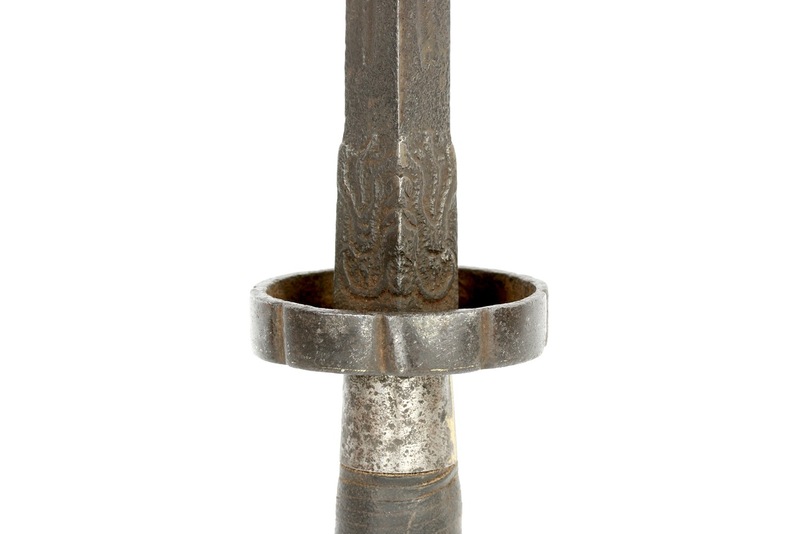 The bian remained in use in the Qing special forces of the Jianruiying , while sets of double jian remained in use among the Green Standard Army.1. 1. See: Yunlu 允祿 et al., eds. ; Huangchao liqi tushi (皇朝禮器圖式) or "Illustrated Ceremonial Paraphernalia for our Dynasty", 1766 woodblock print edition, based on a 1759 manuscript. Chapter 15. Materials: Steel, iron, silver, brass, wood, leather. 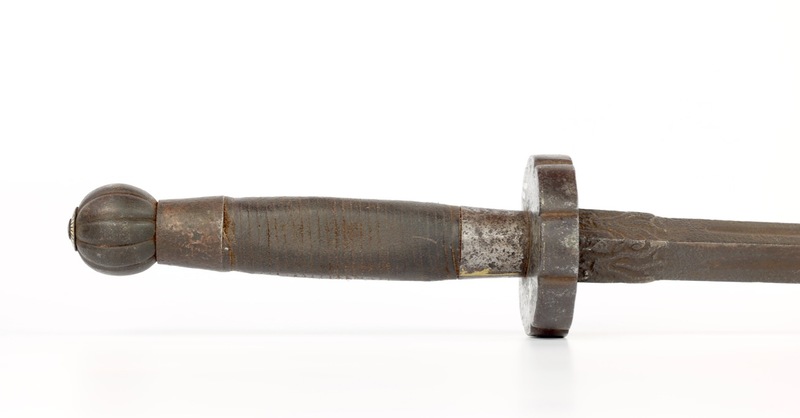 Dating: 19th century, possibly older rod. 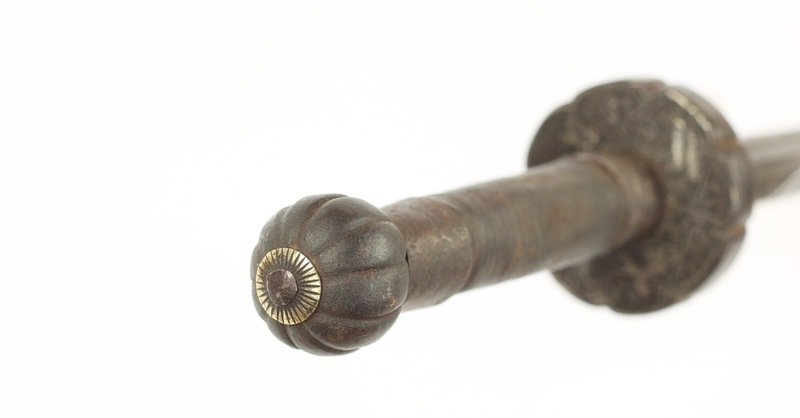 An extremely rare example of a large Chinese mace of the jiǎn (鐧) type. It is built around a long, heavy rod of square cross-section with a groove on each facet, tapering gradually into a dull point. 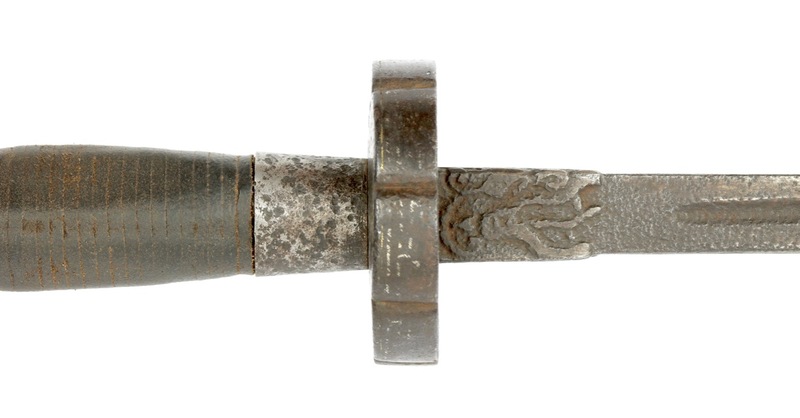 At the base of the blade are chiseled faces of Yazi , one of the 9 sons of the dragon. 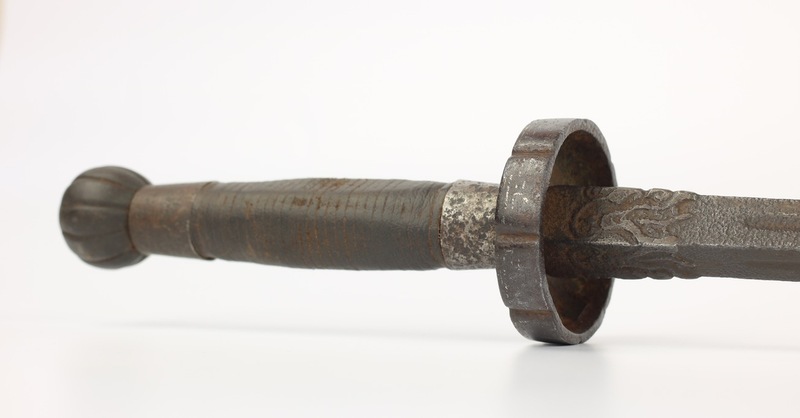 The rod may be considerably older than the fittings, which appear to date from the 19th century. 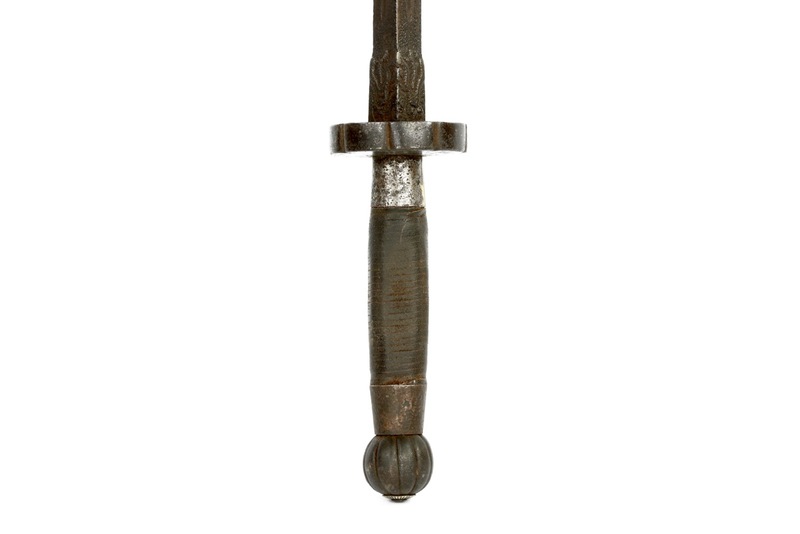 The hilt comprises of a heavy melon shaped pommel that acts as a counterbalance and can be used to close-range striking. The round cup guard with gently lobed rim is decorated on the outside with silver wire overlay in a pattern of interlocking swastikas with auspicious symbols, including a fish, wheel of dharma, and scrolls. The style and workmanship has a strong Tibetan feel and we think at least the guard may have originated in Tibet, or was made by a Tibetan craftsman. The handle comprises of four wooden plates situated around a square cross-section tang. 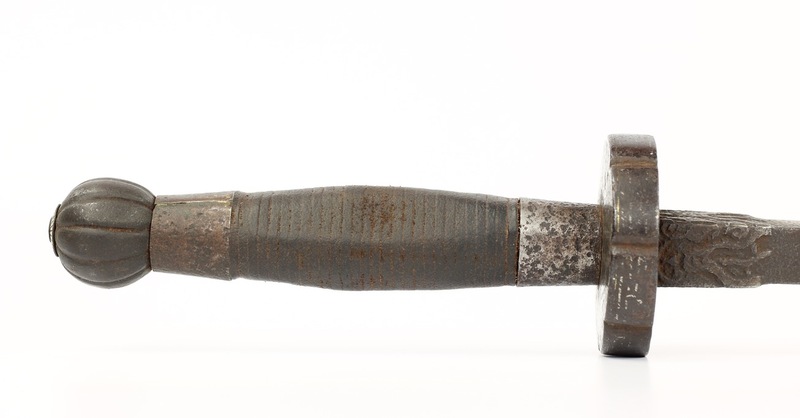 The facets of the tang are at 45 degree angles with those of the blade, probably constructed in this way to give the wielder an idea of the alignment of the rod so he could choose to hit with the flat, or a more damaging strike with the edge. 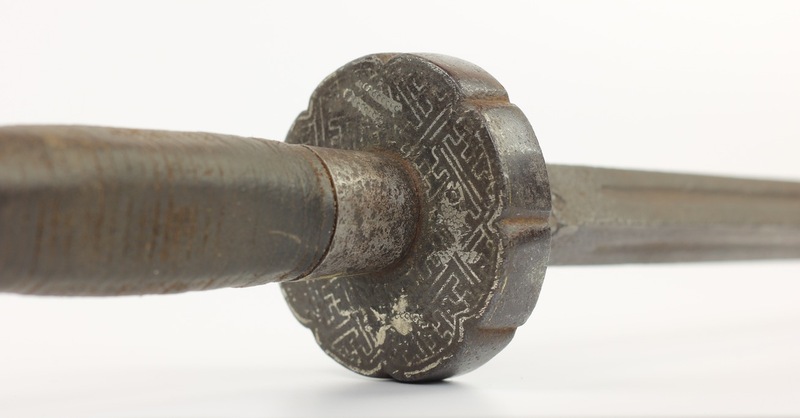 The ferrules are of iron or steel that were soldered, a bit crudely, with brass solder. Another aspect often seen in the design of Tibetan arms. 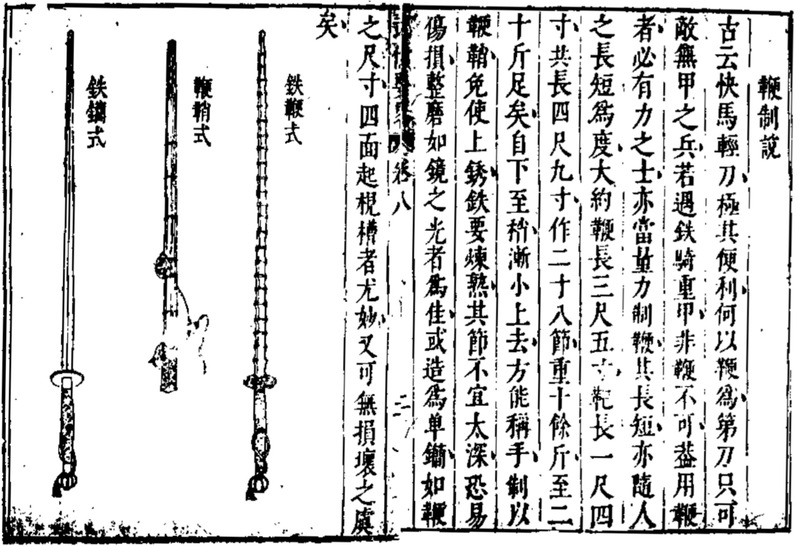 Two handed maces in the late Ming dynasty Wu Bei Yao Lue written by Cheng Ziyi in 1638. 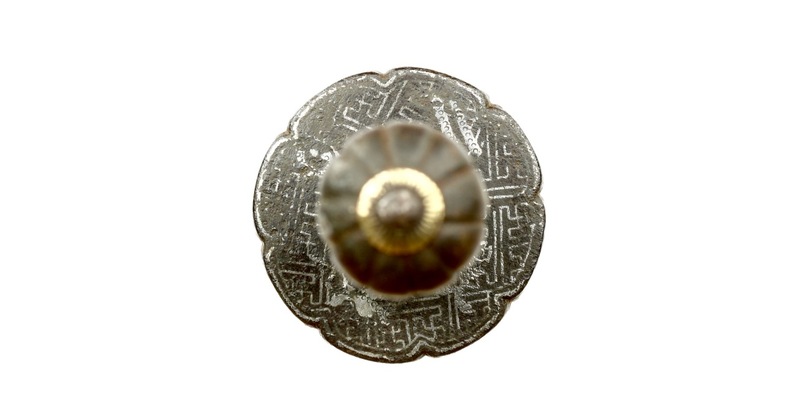 It shows a jian to the left and the sectioned bian to the right. 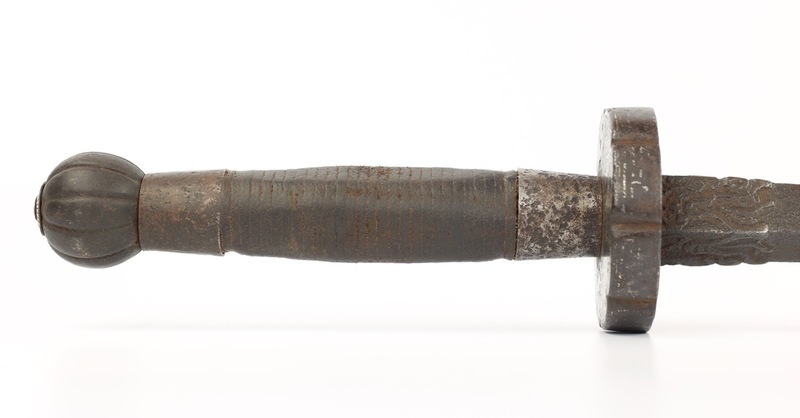 Notice the incredibly similar hilts to our example. Weighing twice as much as many a saber of the time, they could do incredible damage, also to the weapons used to deflect them. This piece feels heavy in hand yet its handle construction and the strong taper of the blade do still give it a rather lively feel. A downside was that one had to be pretty strong to wield one effectively for extended periods of time. 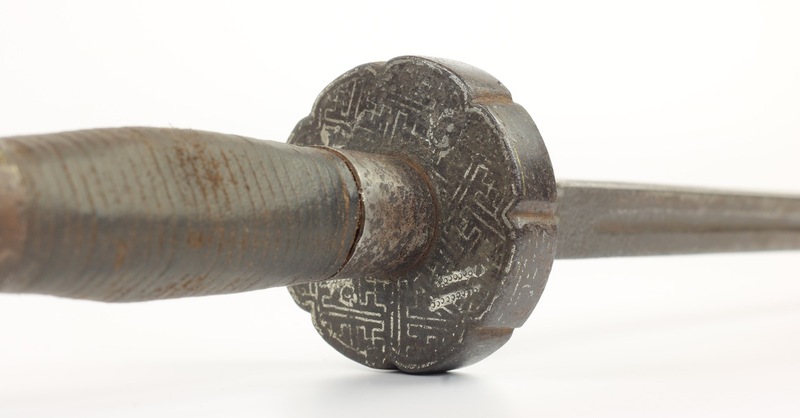 This is why the large sectioned mace, or bian , was only officially issued to the elite forces of the Jianruiying, hand-picked from the strongest and most loyal soldiers of the Qing army. 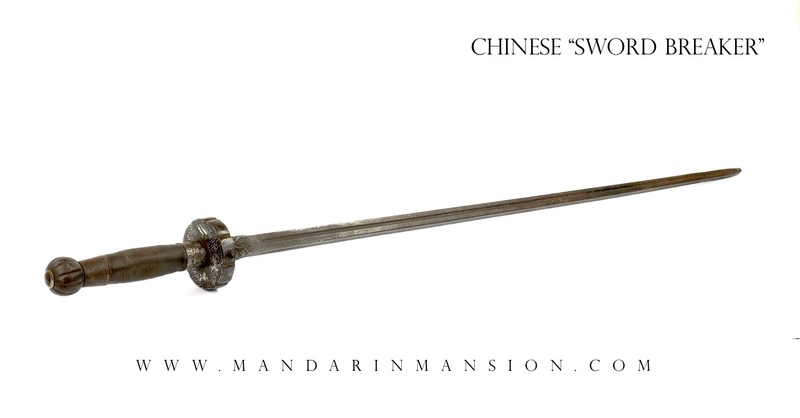 A nice example of one a very rare Chinese blunt weapon. 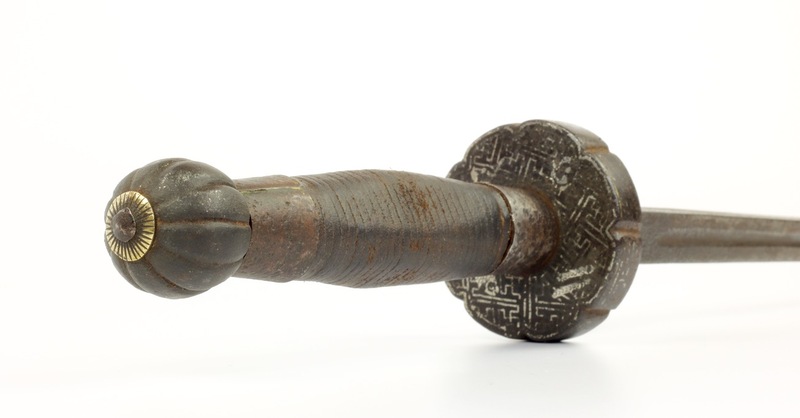 It is built around a massive rod, probably of earlier age, with 19th century fittings that hint towards Tibetan manufacture. It retains remains of silver on the guard. Such weapons were already rare back then, and are incredibly hard to find on today's market.